KEY CONCEPT: An introduction to Pythagoras’ theorem. 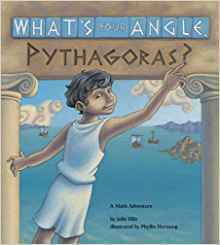 DESCRIPTION FROM THE PUBLISHER: Young Pythagoras can’t seem to stay out of trouble. Every time he tries to help, people get angry. What’s a curious kid to do? On a trip to Egypt, Pythagoras’ curiosity helps him discover the secret of the right triangle. A clever introduction to the Pythagorean Theorem.